Modern technologies are increasingly revealing the tremendous diversity between cancers from different patients, despite similar characteristics under the microscope in the pathology department. Furthermore, in depth analysis of tumours from individual patients is increasingly revealing the diversity of genetic changes both within and between biopsies from the same tumour. Such diversity both between and within individual tumours presents difficulties for the modern era of personalised medicine and the development of new drugs. Of even greater concern is emerging evidence that tumours with greater diversity have worse clinical outcome and an increased propensity for resistance to common anticancer treatments. The Tumour Evolution and Heterogeneity theme is supported by a dedicated lung cancer next generation sequencing facility and a Good Clinical Practice (GCP) laboratory. We work on target validation and patient stratification within therapeutic trials aimed at understanding the changing landscape of the lung cancer genome in individual patients over time and exploiting such changes for therapeutic benefit. Between the CRUK Manchester Institute and University College London, we have access to world class computing infrastructure and data storage. Our bioinformatics teams in London and Manchester are developing new tools to decipher the evolution over time of both non small cell lung cancer (NSCLC) and small cell lung cancer (SCLC) genomes. In parallel, utilising high resolution microscopy, RNA interference and CRISPR genome editing technologies, we are endeavouring to explore the functional basis of somatic changes identified within individual cancer genomes, prioritised through bioinformatics analyses. 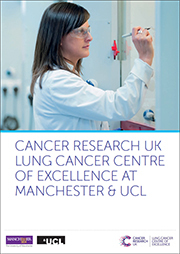 The Centre has close links with industry and is developing a series of cancer clinical trials aimed at identifying key drivers of drug resistance in lung cancer and targeting tumours optimally, based on an understanding of the evolution of individual lung cancer genomes. We will focus on the changing dynamics of cancer cell diversity during anticancer treatment to develop improved understanding of the mechanistic basis for drug resistance and treatment failure. The Centre will study the mechanical processes within a cancer cell that lead to differences between tumour cells and the ability of a cancer cell to tolerate ongoing changes to its genetic material. TRACERx (TRAcking Cancer Evolution through therapy/Rx), the lung cancer evolution longitudinal patient cohort study, will form a central component of studies focussed on tumour evolution and intratumour heterogeneity. The DARWIN (Deciphering Antitumour Response With Intratumour Heterogeneity) clinical trial programme will provide the clinical basis to explore the impact of tumour subclonal dynamics on drug response, acquisition of resistance to therapy and clinical outcome and develop sustainable links with pharmaceutical partners. Through a greater understanding of the processes that drive tumour cell diversity, the Centre will develop means to target diversity through pharmacologic intervention. Through the infrastructure developed, the Centre will provide the pharmaceutical industry and academic clinicians with a personalised therapeutic service enabling the evolution and adaptation of tumours from clinical trial patient cohorts to be studied in real time. Ultimately, it is hoped that such developments will improve precision cancer medicine approaches and the clinical outcome for patients suffering from lung cancer. Leader of the Clinical and Experimental Pharmacology group at the Cancer Research UK Manchester Institute. Chair in Personalised Medicine at the UCL Cancer Institute and Consultant Medical Oncologist at University College London Hospitals NHS Foundation Trust.